What's Wrong with Pakistan's Test Team? I think rather than wondering how the hell Pakistan lost a test match to Zimbabwe, we should be praising Younis Khan for ensuring that Pakistan came out of the series with a 1-1 draw instead of a 2-0 loss, which was sure to happen had Younis not come out with a scintillating double hundred. Losing to Zimbabwe in any form of the game is embarrassing for a top cricket nation. But losing to them in a test match is worse than that. The players should find it difficult to show their faces in public. They should find it difficult to speak to the media. They should be at a loss for words. They should feel humiliated. The upcoming series against South Africa brings this Pakistan test team full circle since Misbah took over in 2010. Misbah's first series as test captain was against South Africa in the UAE in November 2010. During his first 18 months as test captain, Pakistan did not lose a single test series. In fact in the 15 tests they played between November 2010 and February 2012, Pakistan lost only 1! Under Misbah, Pakistan's test team had an enviable test record - Played 15, won 9, lost 1. They won test series against England, Sri Lanka, New Zealand, Zimbabwe, and Bangladesh and drew them against South Africa and the West Indies. The pinnacle of this period was the clean sweep over the number 1 ranked test nation - England, which helped Pakistan rise to number 4 in the test rankings. Their highest test ranking for a decade. And then suddenly something went horribly wrong. Since clean sweeping England, Pakistan have not won any test series. They lost 1-0 to Sri Lanka, were embarrassed 3-0 by South Africa, and humiliated in a 1-1 draw with Zimbabwe, which could have easily been a 2-0 loss. In the 18 months since the win over England, Pakistan has played 8 tests under Misbah, winning only 1 of them, that too against Zimbabwe. While Misbah's overall test record is still pretty good - Played 23, Won 10, Lost 6 - his W:L ratio has gone down from a record 9:1 to 5:3. So what went wrong? When did Pakistan become such a bad test team? The same set of players clean swept England. The same set of players helped Pakistan reach number 4 in the test rankings. What has gone wrong? Pakistan's Test XI against South Africa in 2010 was Hafeez, Taufeeq, Azhar, Younis, Misbah, Asad, Adnan, Rehman, Gul, Wahab, Ajmal. Besides an opener and two pacers, Pakistan's test team is exactly what it was three years ago. In all the test series during the past three years, Pakistan has been consistent with its test team selections. There has been no chopping and changing. Yet, a winning pattern has changed into a losing one. 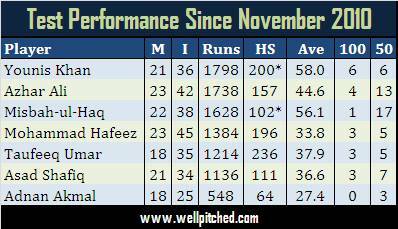 If you take a look at the overall performance of the batsmen during the three years that Misbah has been in charge, it actually shows that they have been quite solid. I do not think that Pakistan has ever had a top 6 that has been as consistent as this one. Pull out the batsmen averages for any 3 year period, I doubt that any 6 will have given a better cumulative performance over a sustained period. 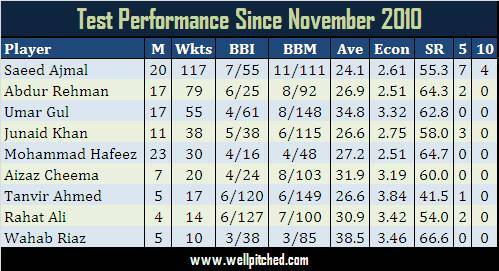 The bowling has been spearheaded by the world's bets spinner, Saeed Ajmal; and his supporting cast been quite strong. 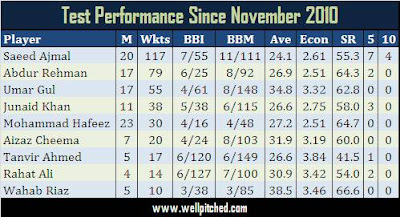 However, there is a stark contrast between the performance of the players in the first 18 months of Misbah's test captaincy and that in the next 18 months. The dip in performance of the batsmen is significant. While three of Pakistan's batsmen averaged above 50, with two averaging well above 60, between November 2010 and February 2012, none of them averaged above 50 during the period between March 2012 and September 2013. There is a clear dip in form of Azhar Ali, who stood like a rock at number 3 during the first half of Misbah's captaincy tenure. While Younis Khan has continued to be a dominating force even in the latter period, there is a big difference from his superlative performance during the initial period. Much like Misbah. There are two clear reasons for this drop in performance levels. Out of the 15 tests in the initial period, Pakistan played 8 of them in the UAE, which even though is not home for the batsman, it is somewhat home and favorable batting conditions. Additionally, out of the 7 away tests in this period, 3 were in Bangladesh and Zimbabwe. Over the next period, Pakistan played all of the 8 tests in testing foreign conditions of Sri Lanka, South Africa, and Zimbabwe. Not playing at "home" has not helped Pakistan's test batsman and they have not been able to translate their super home surface success in foreign conditions. The other reason is scheduling ofcourse. While Pakistan played 15 tests in 16 months between November 2010 and February 2012, they played only 8 test over the next 19 months! Cricket is a rhythm game; the more flow you are in and the better you play. There was a gap of 4 months between Pakistan's successful test series against England and their next test series against Sri Lanka. Additionally, there was an elongated gap of 8 months between that series and their next test series against South Africa, earlier this year. Then they waited another 6 months to play tests against Zimbabwe. Such scheduling helps no one. You can blame the ICC or other cricket boards all you want for not giving Pakistan a good schedule as per the FTP, but the only one to hold accountable for this is the PCB. I understand that Pakistan cricket is suffering because they can't host any team in their own country, but that does not mean that the administrators cannot lobby with other boards to arrange more tours. Especially when the board has witnessed a rise in the team's test performance. Players like Azhar Ali, who only play test cricket, suffer even more as they are kept away from international cricket for long periods of time. Azhar has been a pillar for Pakistan in tests and a key component of their success in the earlier part of Misbah's captaincy tenure; however he failed miserably in the series against Zimbabwe. Can you really blame him? He played no cricket at all besides some meaningless domestic ODI games between March and August of this year. Only the PCB is to be blamed for that. The fans will continue to cry and complain about Misbah's captaincy, Hafeez' non-performance as an opener, the lack of flair of Azhar Ali and Asad Shafiq. But the truth of the matter is that Pakistan cricket is suffering the most because it is not playing enough. It is not touring enough. Pakistan can't host cricket at home, which effects the amount of revenues the board can generate. That impacts the number of development tours that an Under-19 team or a Pakistan A team can make to gain experience of foreign conditions. A lack of international cricket at home means that players wait for long periods between tours making them lose their flow. A greater reliance is put on ODIs to generate funds, which impacts the number of tests Pakistan plays. This has impacted players like Aamir Sohail and Mohammad Yousuf in the past, and now it is impacting the careers of batsmen like Azhar Ali and Taufeeq Umar. Amir Sohail once hit 205 in a test against England at Old Trafford. The commentators likened him to the great Sir Viv Richards. After that series, Pakistan did not play a test for another 6 months. Mohammad Yousuf hit the most runs in a calendar year in the history of test cricket in 2006. He played only 6 tests over the next 30 months! So yes while a defeat against Zimbabwe is sad and embarrassing and humiliating, the players are really not at as much fault as it is being portrayed. The board, the domestic structure, the international isolation of the country are big reasons for our downfall. The fact that we even manage to win in these times is an achievement. Hopefully the upcoming tours at "home" in the UAE will bring some smiles back on the faces of Pakistan cricket fans. Pakistan is rapidly sliding down in international cricket due to several reasons including lack of financial strength in domestic cricket leading to non-competitive cricket infrastructure, inept administration by Pakistan Cricket Board, lack of international cricket in the country and a dried up pool of any upcoming cricketer.